It's nice to add some salad to a meal as starters. And it's really quite easy to make! 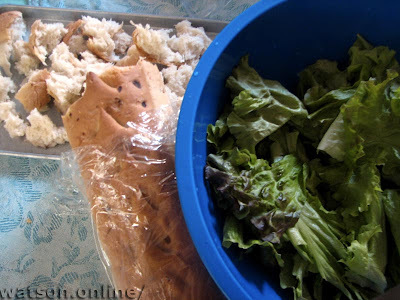 Tear apart the bread by hand into small pieces like croutons. Well, we'll actually be making something like croutons so if you have these already, then that's one step less. Pour some olive oil onto a pan and spread thinly. Place the broken pieces onto the pan and cook in oven til crispy. In my case, I simply used an oven toaster. Same result. 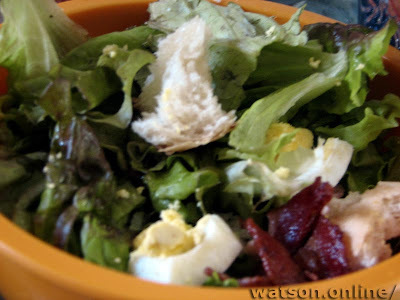 In a bowl, place lettuce, bacon bits, and bread pieces and toss. Add in egg chunks and toss lightly. Sprinkle with a bit of olive oil. 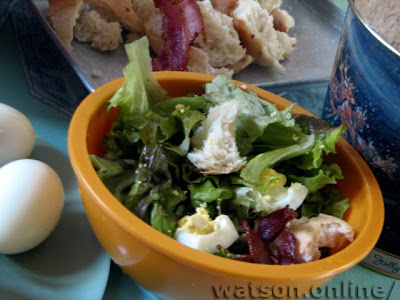 This simple salad recipe is adapted from Jamie Oliver's Jamie at Home TV show, which I watch in Discovery Travel and Living when I catch it. The recipe's so easy I did not have to write it down! I like salads. Especially simple ones. They're perfect especially when you're short on time and hadn't cooked a veggie dish yet. JMom: yeah, just tear and dice up everything and mix up! this is really great!back here in mindanao we have the camote tops salad with ginger,tomatoes,spring onions!with a dash of salt,toyo and vinegar it's one simple salad to go! !best regards!more gastronomic delights to expect here at adobongblog! !